A tourist has got the first glimpse of Elon Musk's megarocket loaded up with the car he hopes to blast to the red planet. Earlier this week he revealed pictures of a the rocket's payload - carrying a cherry red Tesla roadster. Now the closed and sealed fairing was spotted being driven out of a SpaceX hanger by a passing tourist. 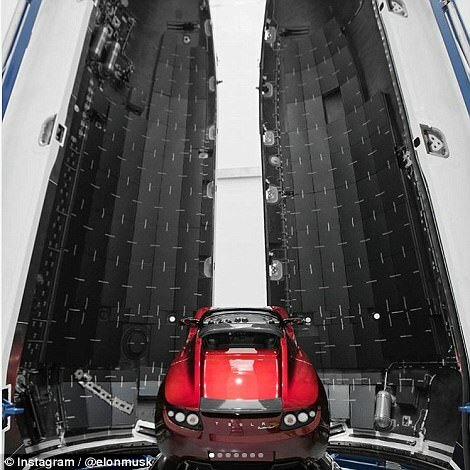 Payload: Earlier this week Elon Musk revealed pictures of the rocket's payload a cherry red Tesla roadster believed to be his own car. Now, the fairing containing it has been spotted at the firm's Cape Canaveral base. 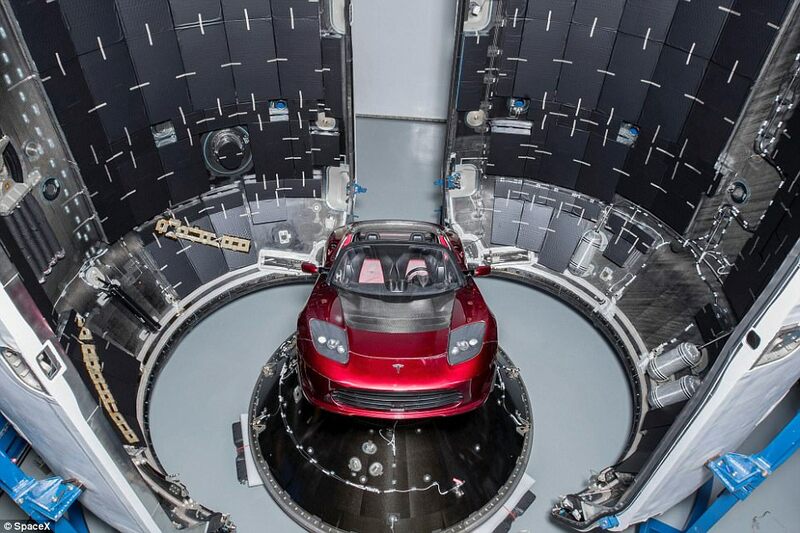 The photos released by SpaceX show one of the still-unreleased Tesla Roadster perched on a large cone inside the Falcon Heavy on what appears to be a secure mount to keep it stationary as the rocket makes its maiden flight. 'Test flights of new rockets usually contain mass simulators in the form of concrete or steel blocks,' Musk said. Musk also last week tweeted an incredible image of people next to a landed rocket to give an idea of the scale of the machines. 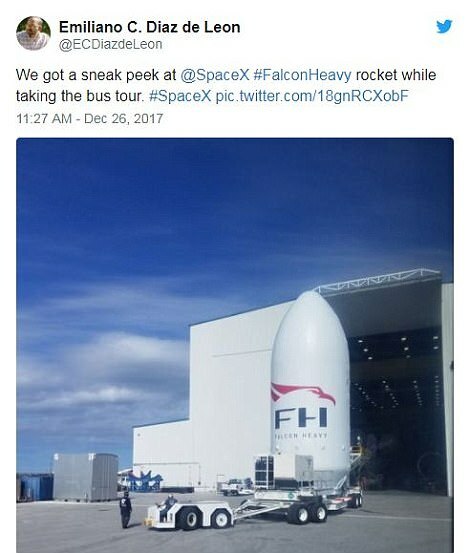 The closed and sealed fairing was spotted being driven out of a SpaceX hanger by a passing tourist. However, some reports claimed Musk's plan to launch a Tesla Roadster to Mars next month blaring David Bowie on the stereo may not be all it seems. Some reports had claimed Musk's plan to launch a Tesla Roadster to Mars next month blaring David Bowie on the stereo may not be all it seems. Payload will be my midnight cherry Tesla Roadster playing Space Oddity. It really is a gigantic stupid stunt serving no purpose but to give Musk more publicity.